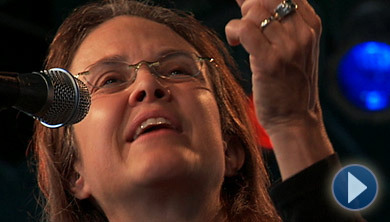 "Music lives inside my legs..."
Naomi Shihab Nye was born in 1952 in St. Louis, Missouri, to a Palestinian father and an American mother. She has lived in Ramallah in Jordan, the Old City in Jerusalem, and San Antonio, Texas, where she currently resides. In her writing, she has been inspired by her experiences as an Arab-American, as well as by richness and diversity of the people and places she has encountered, both in the American Southwest and abroad. Nye captures many of life's little details in a journal she keeps, and her careful observations of things so often overlooked often find their way into her poems. She says, "For me the primary source of poetry has always been local life, random characters met on the streets, our own ancestry sifting down to us through small essential daily tasks." Self-described as "a wandering poet," Nye has wanted to write poetry since she was seven years old, when she composed her first poem. She has gone on to write several poetry collections, as well as essays and novels. Her collection 19 Varieties of Gazelle: Poems of the Middle East was a finalist for the National Book Award. Her many honors include four Pushcart Prizes, a Jane Addams Children's Book Award, a Paterson Poetry Prize, a Guggenheim Fellowship, and a Lannan Fellowship. To read this and other poems by Naomi Shihab Nye, as well as biographical information about the poet, please visit the Poetry Foundation Web site.